$pending Frenzy Kits Have Arrived! First Nations Development Institute (First Nations) is very excited to announce the release of the highly anticipated $pending Frenzy kit! 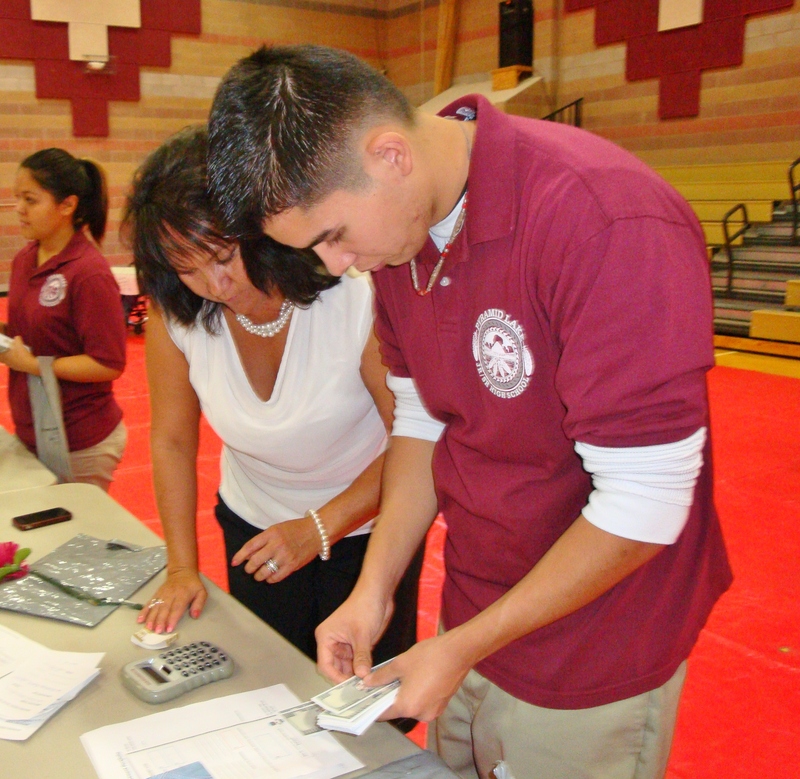 The kit comes with everything you need to host a successful financial reality fair that will help prepare Native American youth for their “Big Money” (also known as a minor’s trust payment). Several satisfied customers have already ordered kits and begun implementing the popular financial simulation event in their home communities. The $pending Frenzy financial reality fair was designed by First Nations to offer youth expecting a large minor’s trust payment an opportunity to practice handling a substantial lump sum of money and to spend it wisely. In the simulation, teens are given $40,000 in fake money and are required to make informed spending decisions to purchase a car, a house, groceries and other items. Students can practice visiting a bank to cash their check and deposit a share of their money into savings, and are also given the opportunity to learn about investing a portion of their money. 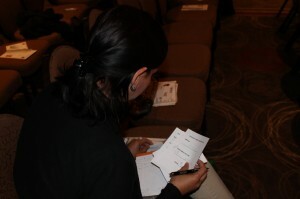 Surveys from $pending Frenzy events held in Native communities across the nation have revealed that more than 90% of participants found the event useful and believed they could use the information from the event to assist them in managing their money. 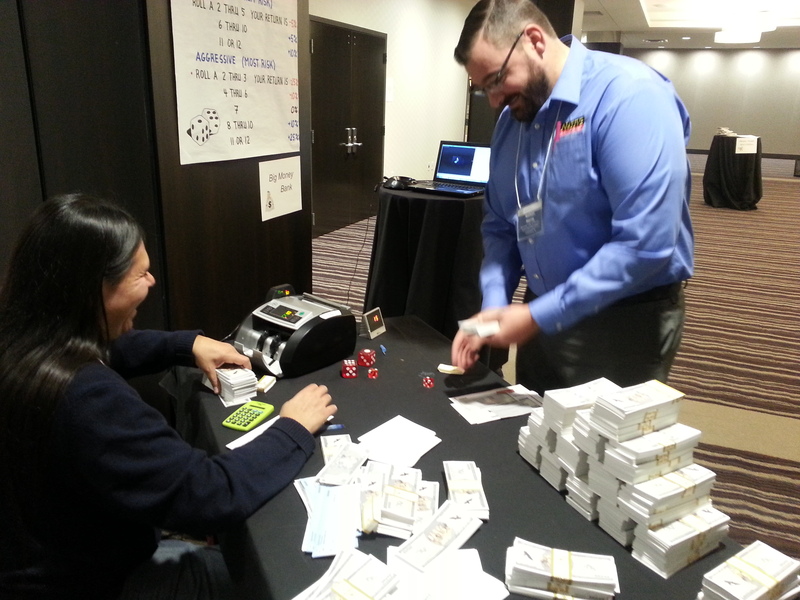 Since the first pilot of the $pending Frenzy with Seneca Nation youth in 2011, First Nations has helped facilitate the financial simulation about two dozen times in 12 different states and 18 unique communities across the country. In total, nearly 1,400 Native youth have participated in the event and learned to better manage their minor’s trust payments. Tribes, community organizations, schools and others have been in… well, a frenzy for the simulation! To keep up with the demand of the $pending Frenzy, First Nations answered the call by producing an all-in-one, do-it-yourself kit. The box kit comes with everything you need to host a successful simulation, complete with all booth materials, a facilitator’s guide, stacks of play money, a professional bill counter, budgeting cards, $pending Frenzy merchandise and more! The all-inclusive kit can be yours for $1,200 and is sent free of charge to your door. To place an order or to ask a question about the kit, please contact Sarah Dewees by phone at (540) 371-5615 or email at sdewees@firstnations.org. 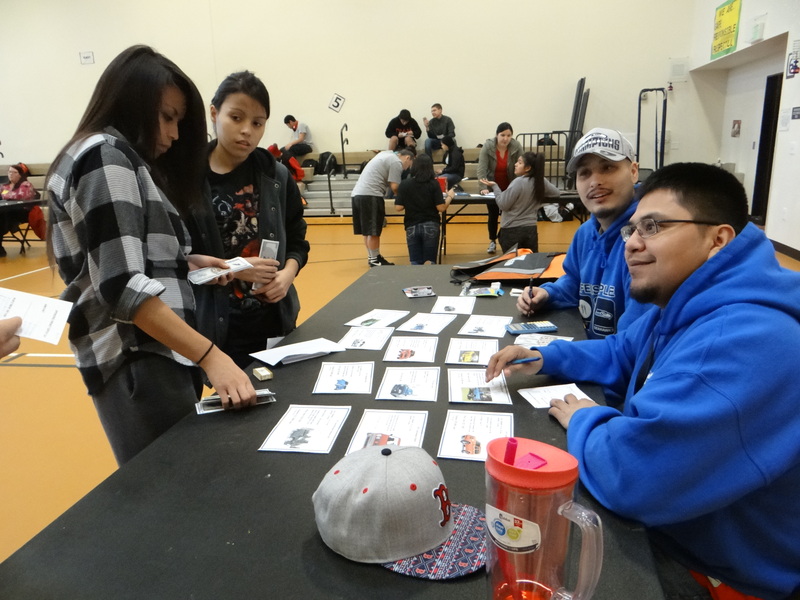 Although April is officially designated “National Financial Literacy Month,” many tribes have already started hosting financial education and money management workshops for their youth. 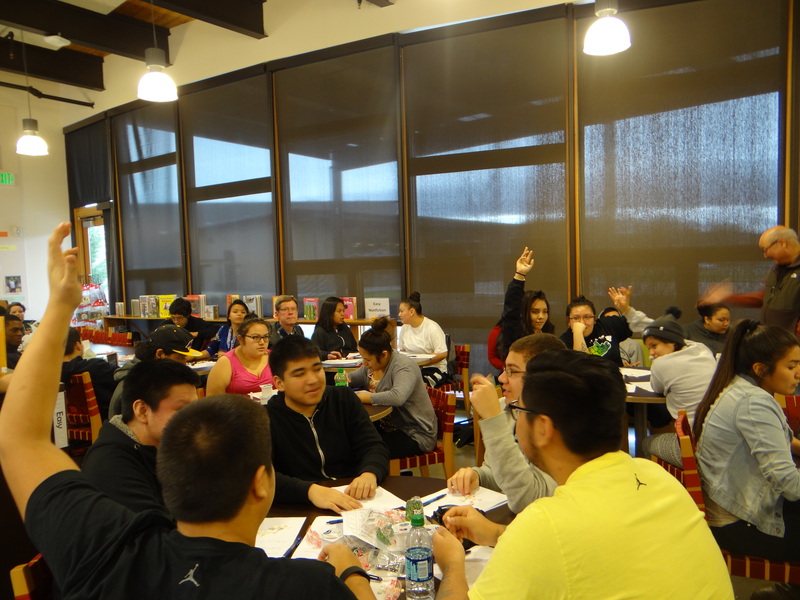 Most recently, faculty members at Muckleshoot Tribal High School, in partnership with the Office of the Special Trustee for American Indians (OST), organized two back-to-back financial education workshops for 30 of juniors and seniors. Most of the students were Muckleshoot tribal members and beneficiaries of the tribe’s minors’ trusts. 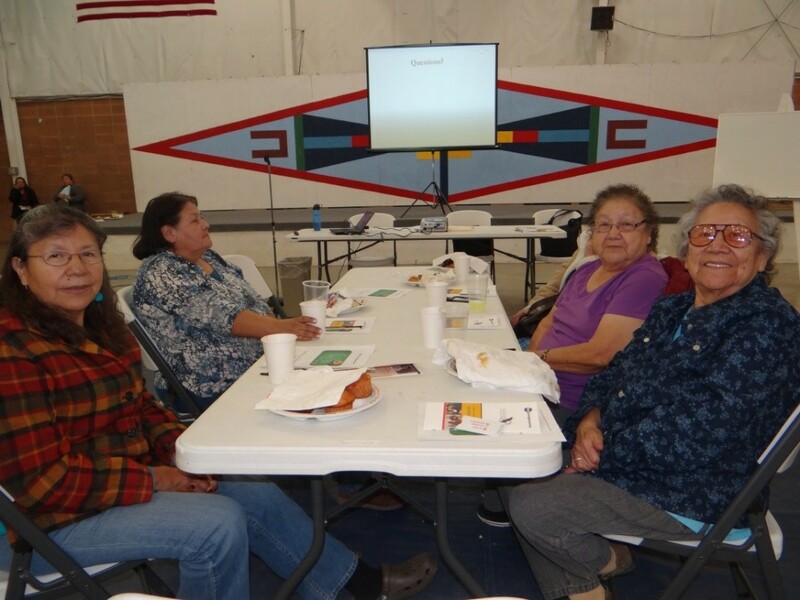 Tribal members are required to complete a senior portfolio of various projects and activities. They are required to complete 15 activities, including two that focus on savings/investment and budgeting. First Nations’ financial education consultant Shawn Spruce led two workshops in February that helped students meet these requirements. The first workshop focused on financial skills development and fraud awareness. Students learned about goal-setting and budgeting, using a bank account, basic investing, homeownership, and fraud prevention. Shawn helped develop the second experiential workshop, $pending Frenzy, approximately three years ago. 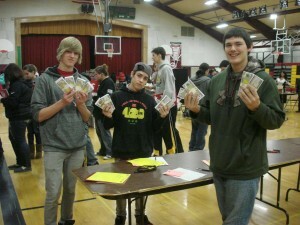 $pending Frenzy encourages creative interactions with bankers and other financial institutions while educating tribal youth about money and responsibility. 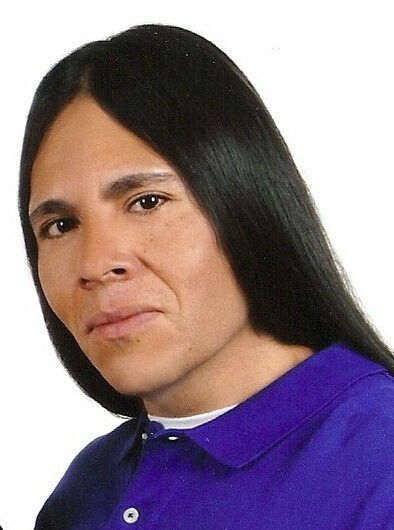 Shawn carefully tailors each workshop to meet the specific needs of each tribe and/or tribal community. 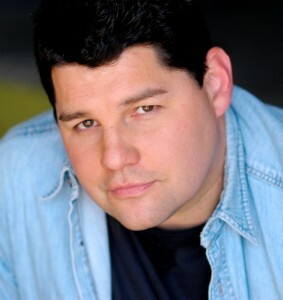 To date, he has helped organize more than two dozen $pending Frenzy financial skills simulations. 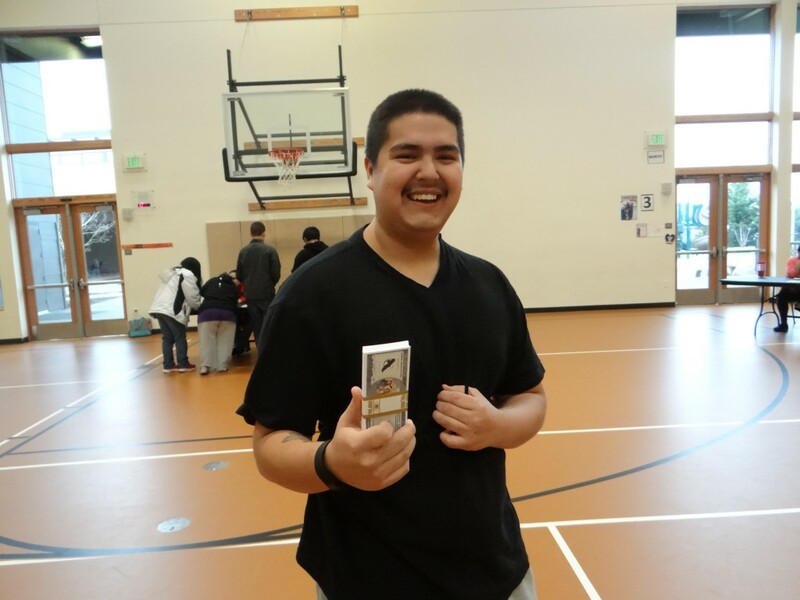 At Muckleshoot Tribal High School, he worked closely with English Teacher Rick Ancheta and OST Fiduciary Trust Officer Marianne Jones to help educate young tribal members on the value of saving, managing personal finances, and healthy credit practices. 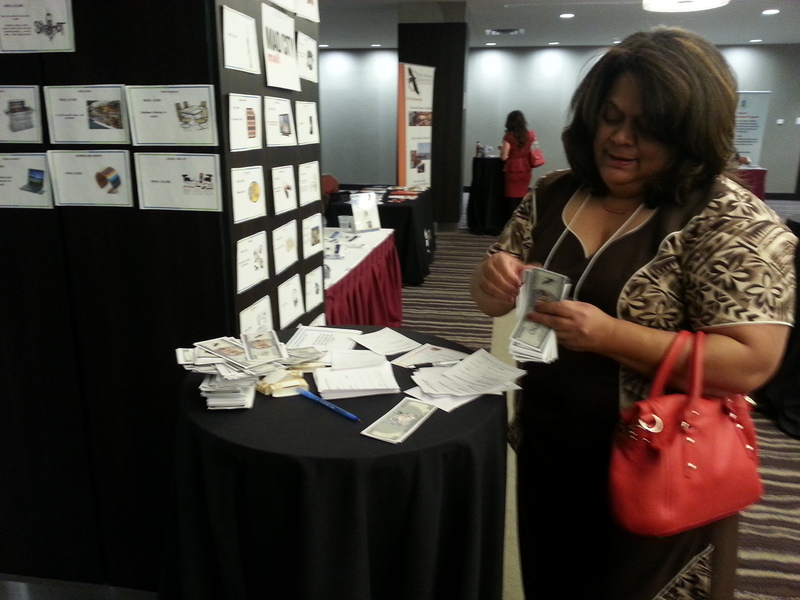 Approximately 20 volunteers participated in $pending Frenzy, managing various merchant booths such as a shopping mall, car dealer, grocery store and even the IRS. 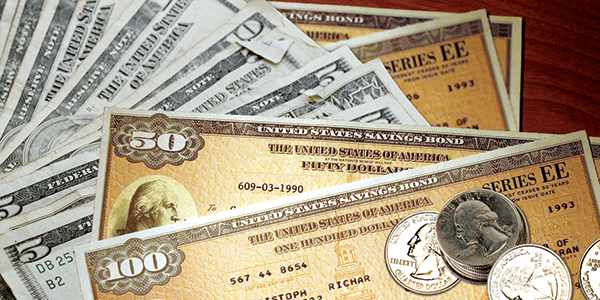 It is never too early to get started on the path to financial literacy. For more information about hosting a $pending Frenzy workshop in your community, please contact First Nations Program Consultant Shawn Spruce at agoyopi@gmail.com. Fraud occurs when someone unlawfully misrepresents information, facts or events for financial gain, and according to the Financial Industry Regulatory Authority (FINRA) Investor Education Foundation, it’s a big problem in America. Each year eight in 10 Americans are solicited with a potentially fraudulent offer such as a phony charity fundraiser or bogus disaster-relief effort. About $50 billion is lost to fraud annually in this country and, sadly, elders are 34% more likely to be targets than middle-age individuals. 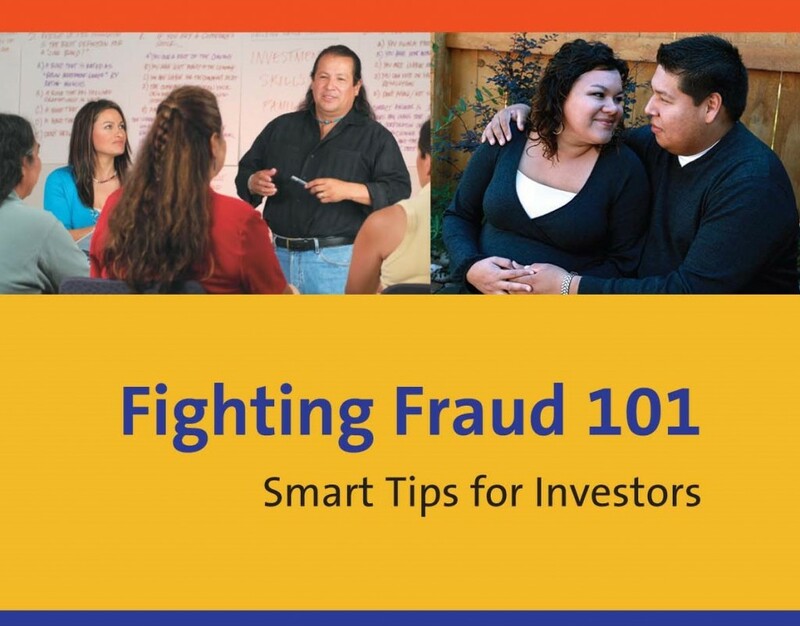 Native-led nonprofit First Nations Development Institute (First Nations) and the FINRA Investor Education Foundation have teamed up to see that Native Americans don’t fall prey to scams by creating the Fighting Fraud 101 campaign. 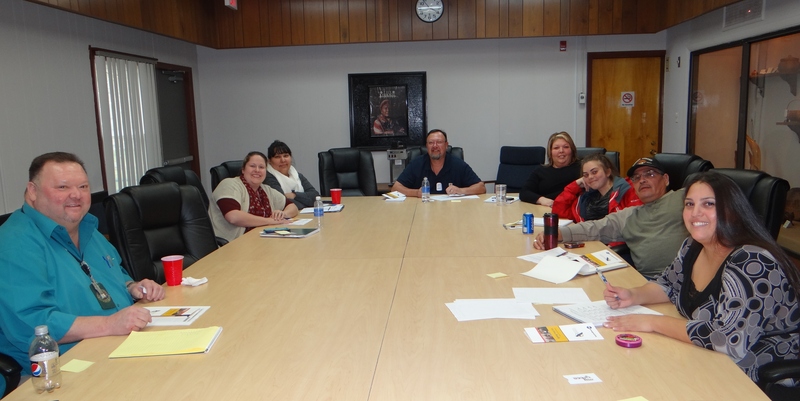 On February 4, 2015, Cherokee Agency Bureau of Indian Affairs employees had a chance to learn more about the exciting awareness campaign as part of an interactive financial skills workshop. Sarah Dewees is the Senior Director of Research, Policy and Asset-Building Programs at First Nations and helped design a Fighting Fraud 101 toolkit to assist Native communities that could be especially susceptible to fraud. She warns that big payouts have focused a lot of attention toward Indian Country in recent years and that technology in the form of text messages, social media and email has made communities that were previously isolated and remote, like much of Indian Country, more accessible to fraudsters. The three-hour workshop was offered in both morning and afternoon sessions and included detailed information on budgeting, financial recordkeeping, retirement planning and basic investing in addition to fraud awareness and prevention. Engaging learning activities were featured to reinforce key topics and concepts. One particularly interesting exercise tested recordkeeping and organizational habits by challenging participants to estimate how quickly and efficiently they could collect critical personal information and documents such as birth certificates, past years’ income tax returns, a current retirement account statement, and even the total amount they spent on holiday gifts last year. For more information on how you can join the Fighting Fraud 101 campaign or to request free fraud-fighting materials, contact First Nations Programs Consultant Shawn Spruce at agoyopi@gmail.com or (505) 247-8861. 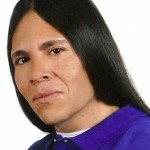 You can dowload the Fighting Fraud 101 pamphlet at this link: http://www.firstnations.org/knowledge-center/predatory-lending. 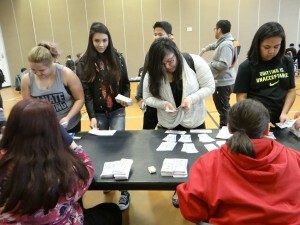 Financial education classes and workshops are mandatory for tribal youth residing on the Colville Indian Reservation in north-central Washington. In early January 2015, 193 students at Lake Roosevelt High School participated in a $pending Frenzy workshop. In 2012, First Nations partnered with the Office of the Special Trustee for American Indians (OST) to offer the $pending Frenzy with Colville youth. 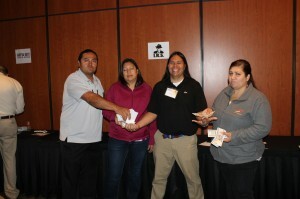 The $pending Frenzy is an interactive financial education workshop that allows tribal youth to practice budgeting and spending a large lump sum of money. 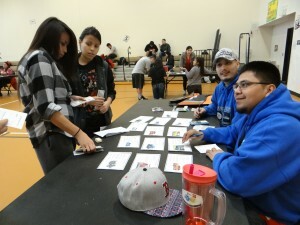 Developed by consultant Shawn Spruce and First Nations Development Institute, the workshop’s popularity has skyrocketed over the past three years and more than a dozen tribes have adapted the $pending Frenzy model for their tribal youth. At Lake Roosevelt High School, students received $40,000 in play money to pay for real-world-like expenses such as rent, utilities, car payments and insurance. 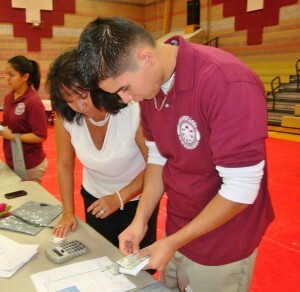 Additionally, students learned to budget money for educational expenses such as tuition and books. Students also learned how to manage their Individual Indian Money (IIM) accounts, which they can access when they turn 18. They learned about current IIM interest rates versus commercial banking interest rates, what their account options are, and how to best manage their monies. 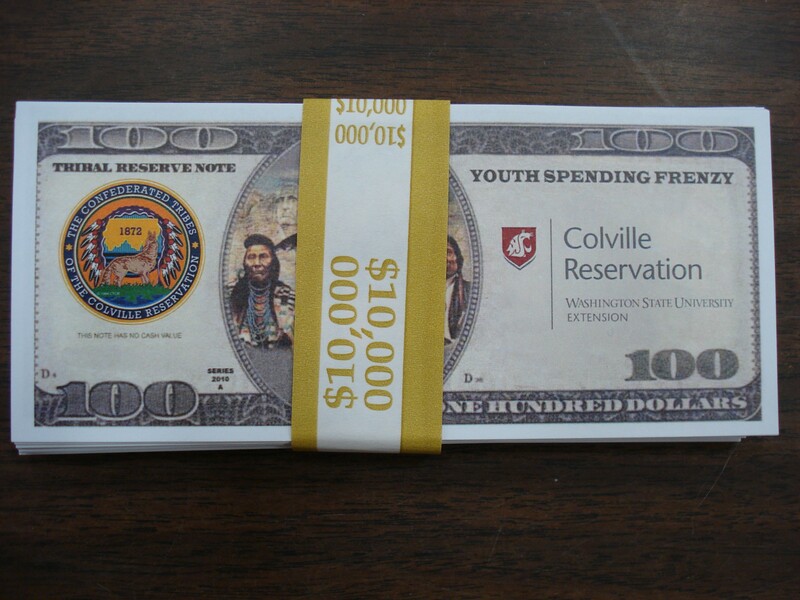 More and more tribes like the Confederated Tribes of the Colville Indian Reservation are making financial education classes and workshops mandatory for tribal youth. For more information about hosting a $pending Frenzy workshop in your community, please contact First Nations Program Consultant Shawn Spruce at agoyopi@gmail.com. In November 2014, Native community leaders from across the nation gathered at the Northwest Native Asset-Building Summit in Minneapolis, Minnesota. First Nations Development Institute (First Nations) was honored to be a part of the summit and present its “$pending Frenzy” workshop to conference attendees. 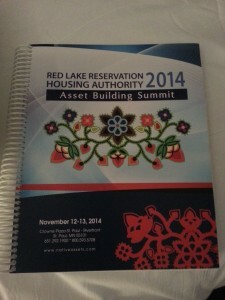 Sponsored by the U.S. Department of Housing and Urban Development’s Office of Native American Programs and the Red Lake Reservation Housing Authority, the Northwest Native Asset-Building Summit focused on asset-building innovations in Indian Country and strategies for advancing economic opportunity around people and place. The $pending Frenzy workshop is based on experiential learning principles – the belief that youth learn by doing. Students learn how to use a bank to cash their check, and then are asked to make decisions about buying a car, buying a home, and balancing their wants and needs while budgeting their money. Unexpected emergencies and opportunities are presented to the youth in the form of “Cards of Fate,” which help them learn to plan for unexpected life events. An increasing number of tribes are providing minor’s trust payouts, or “18 Money,” for their youth. In response to demand from tribes who were struggling with how to prepare their youth for this once-in-a-lifetime event, First Nations developed the $pending Frenzy financial education model. The interactive and dynamic $pending Frenzy was provided to tribal programs from across the country that are working towards incorporating asset-building into their economic development strategies. The $pending Frenzy workshop trained participants on how to conduct their own workshop in their home communities, and then let them go on a frenzy of their own. Participants were provided with play money and then were asked to make a series of budgeting decisions over a two-hour period. The participants had a lot of fun experiencing this interactive event, and several planned to take the program back to their home communities. First Nations was honored to participate in two other workshops at the Northwest Native Asset-Building Summit, including one on Volunteer Income Tax Assistance programs and one on Children’s Savings Account programs. First Nations thanks the U.S. Department of Housing and Urban Development’s Office of Native American Programs and Red Lake Reservation Housing Authority for inviting us to be a part of this important event. What do you get when you combine an innovative and informative financial skills workshop with other financial information geared toward a special land buy-back program? You get lots of attendees – more than 200 – who are highly interested and engaged landowners and their families! In November 2014, First Nations Development Institute (First Nations) worked with the U.S. 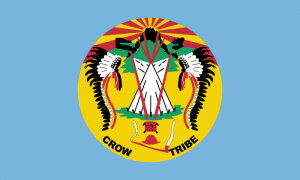 Interior Department’s Office of the Special Trustee for American Indians, the Crow Nation, and the FINRA Investor Education Foundation to offer a series of financial skills workshops designed to assist landowners on the Crow Indian Reservation in Montana. The full day of outreach also included presentations by senior advisors from the newly formed Land Buy-Back Program for Tribal Nations (LBBP). 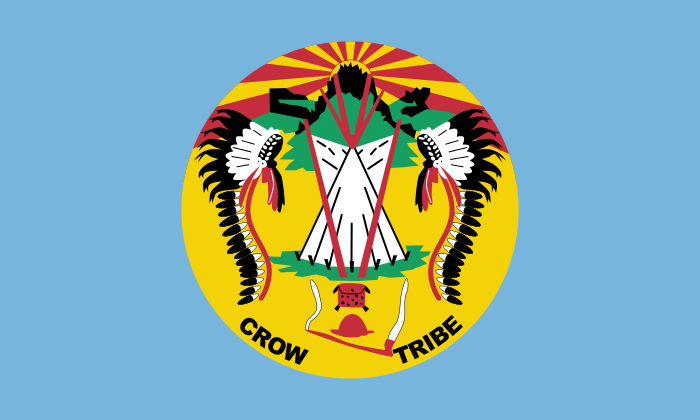 Information booths were provided by the Office of the Special Trustee, the Bureau of Indian Affairs (BIA), and the Crow Tribe to provide assistance to landowners with questions about their offer packets from the Land Buy-Back Program and related issues. The financial skills workshop was developed in response to demand from certain tribes who wished to prepare their members for the Land Buy-Back Program opportunity. The Land Buy-Back Program for Tribal Nations was established by the Interior Department to implement the land-consolidation provisions of the Cobell settlement agreement. The settlement provided for a $1.9 billion Trust Land Consolidation Fund to consolidate fractional land interests across Indian Country and will ultimately affect approximately 150 unique reservations that have fractional interests. The Land Buy-Back Program allows interested individual owners to receive payments for voluntarily selling their land. All interests sold are restored to tribes, which helps to keep Indian lands in trust for tribal communities. There are several more land buy-back events planned in 2015, and First Nations plans to coordinate with the Office of the Special Trustee, the BIA and the Land Buy-Back Program to continue their outreach and training on avoiding fraud and successfully planning for windfall payments. Growing up in Adair County in rural northeastern Oklahoma, Brian Ross was a shy, soft-spoken teen until a high school speech class changed his life forever. Building a unique platform from which to launch various financial education initiatives such as youth outreach, curriculum, and financial coaching. Supporting OST’s extensive field staff with financial education train-the-trainer workshops and related resources. Providing financial education for OST employees who serve as ambassadors and must set good examples in the communities they serve. Establishing a recognizable brand that effectively conveys OST’s mission of fostering financial education. Creating lasting synergy with partners that include tribal governments, nonprofits, schools, and other federal agencies dedicated to financial education. These topics are personal to Brian. As a child he witnessed tremendous poverty and what he calls needless suffering in one of the poorest counties in Oklahoma. And while he acknowledges that financial hardships can be a personal choice, he believes the underlying cause is often a lack of knowledge and available resources. Later, while attending college, he became frustrated by the fact that no financial education services existed for students and he was forced to seek out his own financial role models. One of these individuals was his Cherokee grandmother. On a final note, Brian points out that, just like with public speaking, there are no magical solutions to handling money wisely. Furthermore, he says OST will not create any new financial education concepts or gimmicks with any of the aforementioned initiatives. Interested in partnering with OST to bring financial education to you community? For more information feel free to contact Brian directly on his cell at (918) 977-0848 or by email at brian_ross@ost.doi.gov. 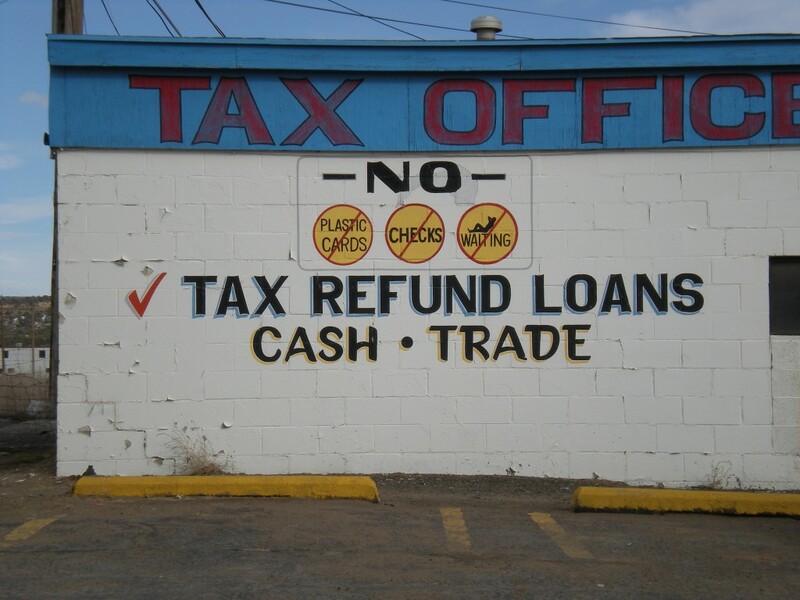 Financial fraud is far too common in Native American communities, and is a growing problem with the recent increase in tribal lawsuit settlements with the federal government. 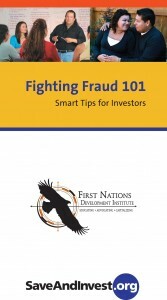 First Nations Development Institute has partnered with the FINRA Investor Education Foundation to produce a pamphlet that can help people protect themselves from common financial fraud techniques. Over the past five years more than $1 billion in tribal trust settlements have been reached, including the Keepseagle and Cobell class-action legal settlements. Many of these settlements have resulted in payments to individual tribal members, which makes them targets for fraudsters who follow a simple strategy: They go where the money is. The FINRA Investor Education Foundation is collaborating with First Nations to help reach the recipients of these trust fund settlements, as well as other tribal members who may be targeted for their wealth. The pamphlet, titled “Fighting Fraud 101: Smart Tips for Investors,” is designed to appeal to individuals, members of tribal investment committees, and retirees. It lists some common fraud tactics, such as the “Social Consensus” tactic that lead you to believe that your savvy friends and neighbors may have already invested in a product. With the “Source Credibility” tactic, a fraudster may falsely suggest they have worked with other tribal investment committees or helped people manage lump sum payouts from tribal lawsuits to try to gain trust. The pamphlet also teaches several techniques to avoid being taken advantage of and how to report suspicious behavior. “We are honored to be able to collaborate with several national partners, including the FINRA Investor Education Foundation and the Office of the Special Trustee for American Indians, to provide financial education for tribal members,” said First Nations President Michael Roberts. First Nations representatives Sarah Dewees and Shawn Spruce spoke at an October 29, 2014, Federal Trade Commission event titled “Fraud Affects All Communities.” The purpose of this meeting was to highlight the range of consumer, financial and investor fraud techniques that affect diverse communities. A copy of the pamphlet can be viewed in First Nations’ online Knowledge Center at http://www.firstnations.org/knowledge-center/predatory-lending/research. To order printed copies, you can email info@firstnations.org. First Nations Development Institute held its 19th Annual Leadership and Entrepreneurial Apprenticeship Development (L.E.A.D.) Conference at the Tulalip Resort Casino on Sept. 24-26 this year. Over 175 participants came to learn more about a range of topics related to economic development on Indian reservations. One conference track was dedicated to Youth Development and featured many innovative youth programs that support youth employment, education and financial empowerment. On Friday, Sept. 26, financial educator Shawn Spruce conducted a “Spending Frenzy” training workshop that was designed to help tribal colleges, CDFIs (Community Development Financial Institutions), internship programs, and Boys and Girls Clubs offer financial education programs. The Spending Frenzy is designed for youth and provides participants with a pile of play money and lets them go on a spending frenzy where they can make a series of financial decisions related to buying a car, buying a home, and paying for life’s expenses. Participants travel between stations where they are asked to make a payment using the play money and record that payment in a ledger. The goal is to finish the workshop with all the bills paid and some money left over. 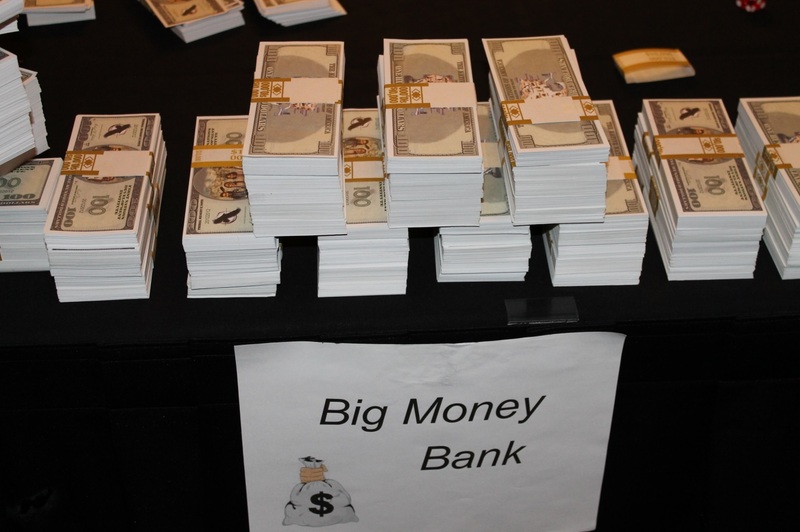 The first stop is at the Big Money Bank, but people are often disappointed when they learn they also have to visit the IRS and pay taxes on their income. More than 30 practitioners from programs across North America participated in the training. Staff from First Nations and Chief Dull Knife College helped work at the stations and conduct the workshop.